The Vintage Car Club in McCrae…it’s for people. You would be forgiven for thinking the Vintage Car Club was all about shiny old vehicles and passionate tinkerers… but this club is not what you think. The Vintage Car Club is a neighbour group in McCrae, on the Mornington Peninsula in Victoria, named after their local streets, all sharing vintage car names. You’re more likely to see these group members chatting over the fence or sharing a cup of tea than polishing their hubcaps, and that’s just the way they like it. What turned this area into a blossoming community was 60 initial letterbox invites, leading to 20 attendees at that first meeting. In just over a year, these former strangers, along with new additions, have built ties that enrich their lives on a daily basis. It could be simple things like a neighbour willing to keep an eye on your property, collect your mail or feed your pets. It could be the answer to the infamous problem: I have no one to do this with. These residents manage to find company for interests like water aerobics or dog walking. It could be ad hoc help: Does anyone have a juicer? Yes, someone probably does. But this group can also take credit for grander victories: they rallied to help a neighbour move into a retirement home. They come to the aid of an older resident when she is frightened or needs a hand. Two people who lost spouses have found a strong system of support against their pervasive depression. And more often than not, there is someone to have a laugh with on the other side of your fence. “It’s good fun, we’ve gotten to know each other. We feel part of a community now and most of us felt isolated before,” says Jenny McCarthy, the Connector who first opened her door to a more connected neighbourhood (quite literally, too, seeing as the initial invites welcomed her then-unfamiliar neighbours into her home and life). And now? “I’ve got all these neighbours I could call any time of day or night and they would help,” she tells us. The fact that everyone in the group is still enthusiastic about it, 13 months later, is a testimony to how community can become a steady network that helps you through life. Vintage Car Club has kept the ball rolling by welcoming new faces, organising simple events, and just being there for one another. It has added a layer of interaction, support, and safety to the lives of its members—the kind that can be facilitated only by those who surround you. 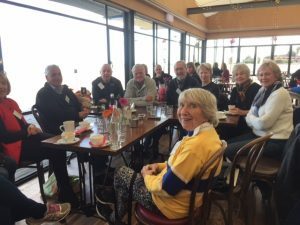 St Kilda West Neighbours Group catch up over coffee. 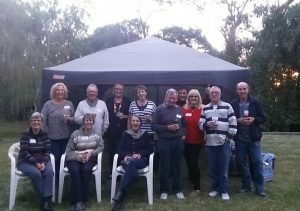 Going on three years now, the St Kilda West Neighbourhood Connect Group has cultivated a community that gives its members a sense of home and belonging, not just a coincidental similarity of addresses. Catch-ups, walks, movies, and just “giving each other a hand” are all part of it, says Clare, who is grateful for the lovely people and new friends she has met as a result of this neighbour group.